The MOD5 Helmet from Oakley offers fantastic protection without adding a tonne of weight to your day. Do you have a question? It has a cleaver hybrid design, Oakleys Modular Brim System that prevents goggle fog, and a glove friendly magnetic fastener, making your helmet the least of your worries as you take to the slopes. The MOD5 has a hybrid construction of ABS in the front and In-Mold in the rear to make the helmet durable and lightweight at the same time. Oakley define the points in the helmet most likely to take a hit, and reinforce these with ABS material to protect your grey matter. The MOD5 has the Modular Brim System thats designed to offer a smooth transition from goggle to helmet. This compliments Oakleys Keep it Moving vents, that allow air to flow freely from your goggles, up through the brim and out of the top of the helmet. As a result, youve got a helmet that reduces sweat and goggle fog. Youll get a super-custom fit thanks to the BOA dial at the back of the MOD5 helmet. Cranking this fits the removeable liner neatly around your head. The removeable ear pads dont put any pressure on your lugs, meaning they are comfortable and dont restrict hearing. The soft chin strap is super-comfy and is easily opened and closer with a glove on thanks to Oakleys cleaver magnetic fastener. Awesome protection, fog clearing and comfort what more could you want in your ski helmet? Reinforced ABS shell at impact points. Dry Keep it Moving air channel. Customisable fit with BOA dial. Easy to use magnetic strap catch. Credit/Debit Card via telephone - message for details. Cash on Collection from our Edinburgh Store. All UK & European orders will be subject to UK VAT where applicable. We may also be able to accept items back outside this time period. If there is anything you need, please don't hesitate to get in touch and we'll try our best to help. If we like it, we stock it - if we don't think it's good enough, we won't have it in the store - simple as that. This way you can be sure that when you shop at Freeze, you are choosing from the very best equipment, selected by experts. Good service comes as standard. At Freeze we pride ourselves on the service we offer. Since the very beginning, we have treated our customers as friends - many of them have indeed become close friends over the years - and this is an attitude we consider to be very important as we grow. Whether you come into the store, or interact with us online, we want you to have the very best experience, so if there's anything you ever want to talk to us about, please get in touch. It might be the smallest of things but sometimes it's those that can be the most important. It might be a design element in the shop that shows something in the best light, or just the way you move through the website - we put care and attention into everything we do, and still always find ways we can improve. If there's something that you think we can do better the let us know - our shop is your shop. This isn't just an industry to us, it's a community. We have a team of local riders that we support as well as international representatives. We grew with the support of the community, and will always look to cherish the roots of the sports that gave us the passion to do what we do. 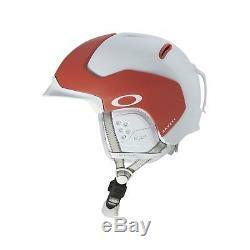 The item "Oakley MOD5 Helmet Unisex Protection Safety Ski Snowboard New" is in sale since Tuesday, August 21, 2018. This item is in the category "Sporting Goods\Skiing & Snowboarding\Ski & Snowboard Helmets". The seller is "freeze_pro_shop" and is located in Edinburgh, United Kingdom.